Submitted Photo The 2018 Dunkirk Moose Golf League Champions are Dave Criscione and Dave DeJoe. 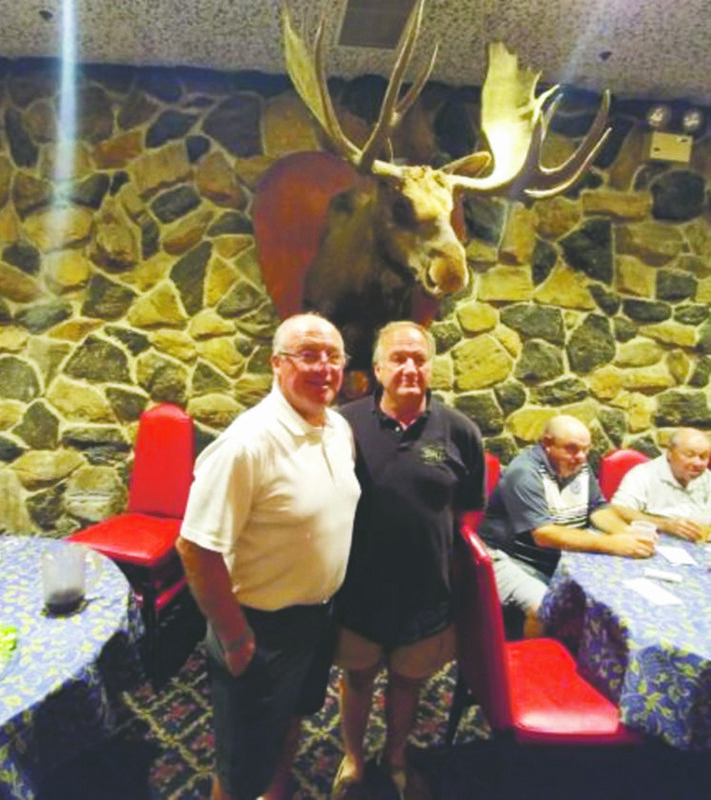 The Moose League plays golf Thursday evenings at the Vineyards Golf Course in Fredonia. Dunkirk at Olean, 4:30 p.m.
Silver Creek at Maple Grove, 4:30 p.m.
Allegany-Limestone at Chautauqua Lake, 4:30 p.m.
Westfield at Pine Valley, 4:30 p.m.
Cassadaga Valley at North Collins, 4:30 p.m.
Dunkirk at Southwestern, 4 p.m. Maple Grove at Chautauqua Lake, 4 p.m.
Sir Prints A Lot Game MVP Matt Sheridan. Elevation’s Kevin Burns threw for three touchdowns. Team GMB’s Deon Stanford totaled four touchdowns. Those interested in becoming certified to officiate high school boys and girls basketball, classes will start today at 7 p.m. at Jamestown High School in room 250. Classes will be held every Wednesday and will be taught by Roger MacTavishs. Any questions you can call Roger at 664-6339. Registration for the 2018-2019 season is underway! You can register in person on Saturday at Lucky Lanes from 10 a.m. to 2 p.m. each day. You may also register on Thursday from 7 p.m. to 9 p.m. All new and returning bowlers must register. The registration fee is $10. Youth bowler ages range from 4 to 20 years old as of Aug. 1, 2018. Teams may be all boys, all girls, or mixed. Teams will consist of four bowlers. Leagues will start on Sept. 22. All bowlers from ages 6 to 20 will have their choice of bowling at either the 10 a.m. or the 1 p.m. shift each Saturday. Bowlers of ages 4 and 5 will participate in the Bumper Buddies league, which bowls at 1:15 p.m. on Saturdays. Visit bowlingisfun.org for more information or call Greg Haase at 785-3058. The Fredonia State Blue Devils men’s and women’s soccer programs are hosting Kids’ Day at University Stadium this Saturday, beginning at noon. The first 200 kids will receive a Sahlen’s hot dog and a noise stick to cheer on the Blue Devils. The women’s game begins at noon, with the men’s game at 2 p.m.